The kids and I took our annual trek to Mishawaka, IN for Free Comic Book Day today. 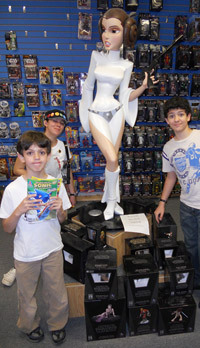 Our “local” comic shop, BuyMeToys.com does an awesome job of hosting the event. They’ve been doing it regularly since the first year it was introduced, where I got my still prized “I’ve Got Issues” t-shirt (or maybe that was year two?). Regardless, they run a great shop and are very supportive of the local comic creators, holding regular workshops. The owner Casey Heying, is the artist and co-writer of a really cool cross-over comic series (with Ben Avery) between Alice in Wonderland and The Wizard of Oz based in a current reality where the girls have both grown up and live together. I won’t even attempt to do the series justice by explaining it. It’s called Oz/Wonderland and you really should check it out of you haven’t. Anyway, as they have in past years, they were giving out five issues to each person that came in to the store today. They had a huge selection to choose from including this year’s FCBD offerings as well as many left over from previous years. Also up for grabs were pins, bookmarks and other comic related items. We had a good time and left with new treasures to read. My only gripe about this year wasn’t with our local shop at all. It just seemed like there was less variety (especially from the independent publishers) to choose from in this year’s offering of FCBD exclusive books. Regardless, we enjoyed the day and look forward to next year. Thanks Casey and Kelly! Tagged Ben Avery, Casey Heying, FCBD 2010, Free Comic Book Day, Free Comic Book Day 2010, Oz/Wonderland. Bookmark the permalink.